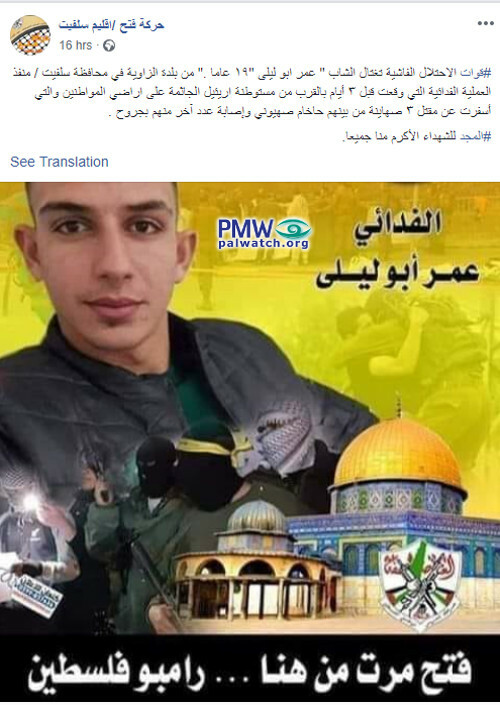 Posted text: "The fascist occupation forces assassinated Omar Abu Laila, 19 (i.e., terrorist, murdered 2) from the town of Al-Zawiya in the Salfit district, the one who carried out the self-sacrificing operation (i.e., terror attack) that took place three (sic., 2) days ago next to the settlement Ariel, that sits on the [Palestinian] citizens' lands. Three (sic., 2) Zionists were killed in the operation, among them a Zionist rabbi, and some others were wounded. Glory to the Martyrs who are more honorable than all of us." The image shows terrorist Omar Abu Laila who murdered 2 Israelis. Below him we see on men masked in keffiyehs (Arab headdresses) holding rifles on the left, the Dome of the Rock and the Dome of the Chain before it in the center, and the Fatah logo that includes a grenade, crossed rifles, and the PA map of “Palestine” that presents all of Israel as “Palestine” together with the PA areas on the right. Text at bottom of image: "Fatah was here - Rambo of Palestine"
Omar Abu Laila – Palestinian terrorist who stabbed Israeli soldier Gal Keidan, stole his weapon, and shot and murdered him at Ariel Junction on March 17, 2019. Abu Laila then shot at passersby, murdering Rabbi Achiad Ettinger, and stole the car of a civilian who had fled the scene, which he drove to Gitai Avishar Junction, west of Ariel, where he shot and seriously wounded another Israeli. Abu Laila was shot and killed on March 19, 2019, during a gunfire exchange with Israeli soldiers when they attempted to apprehend him.